A flexible, conformable general purpose unbleached cotton cloth tape with a specially formulated adhesive to give ample coating for the tape to be removed cleanly without leaving residues of adhesive. Un-coated natural cloth tapes can be painted, making them ideally suited to film & studio “scene set-making”. They can be removed leaving minimal adhesive residue, due to the “easy-peel” characteristics. 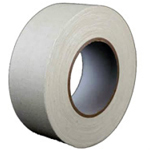 They can also be used as no glare camera tapes or as protection type “grip tapes” for gymnasium equipment. Not waterproof.